Kate’s brand is her art. 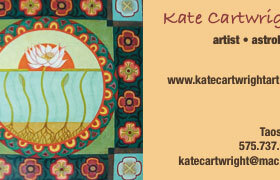 Artist Kate Cartwright preferred that her art be the focus of her brand rather than a conventional logo. One facet of our solution for Kate was to use a script font very similar to her own handwriting, and use it consistently on her website and marketing collateral. We use colors that are evocative of the Southwest region that is so predominant in her work.